I wanted to let you all know how excited I am to be chairman of Norwescon again. It has been 4 years since I was last chair. Many things have changed since then, but one thing has remained consistent; Norwescon is put on a by a very dedicated group of volunteers who are very passionate about their convention. Norwescon is always looking for more people to join us on putting on one of the best conventions around. If Norwescon has improved your life in someway, I am asking you to consider volunteering a bit of your time to help keep Norwescon a strong healthy convention. This could be as little as volunteering for a couple of hours at the convention, to joining us on the convention committee to help plan each year’s convention. One of things we were very excited about last year was the use of Maxi’s Bar at the top of the tower for night time events. We had hoped that we would be able to continue this in future years, but the cost for Norwescon to use this space for the 2 nights turned out to be much higher than anticipated. In today’s tight economy the executive team and myself felt that the cost was too high for an age-restricted venue that only a small portion of the membership used last year. I hope to see you all at the convention this coming April. Would you like to promote your club? Then reserve space to run a social in Hospitality. You can have 1 or 2 hours or more. Just contact Personnel@norwescon.org and let us know more about your group and how we can help you. We are planning another amazing art show for you again for Norwescon 34. We are once again bringing you great local talent, as well as new artists, which we hope will create an exciting art show for you this year. We are thrilled to feature this year’s Artist Guest of Honor, Kinuko Y. Craft. Ms. Craft has won numerous national awards, including 4 Chesleys, gold and silver medals from the Society of Illustrators, and is a Spectrum Grand Master. She is also the illustrator for many of the books by this year’s writer guest of honor, Patricia A. McKellip. We are excited and honored to have Ms. Craft as our Artist Guest of Honor this year. Something new and exciting is happening this year at the Norwescon art show: students. 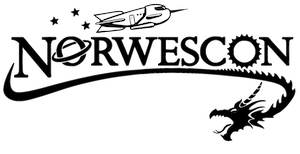 Norwescon is sponsoring scholarship programs this year; one for Tyee High School, which is located less than a mile from our location, and another for the Northwest School of Art in Poulsbo. Art will be displayed in our art show and judged at Norwescon for the awarding of the scholarships. We are pleased that we are able to support the up-and- coming science fiction and fantasy artists of the future, and hope we can continue this program for years to come. News for artists: All of the information that you need to sign up for the art show is on our website at norwescon.org/exhibitors. If you have any questions always feel free to contact us directly. You can reach us at artshow@norwescon.org. The art show is looking for more great volunteers. Become part of the team who through their hard work make the art show fun and successful. If you are interested in joining us, we would love to hear from you. 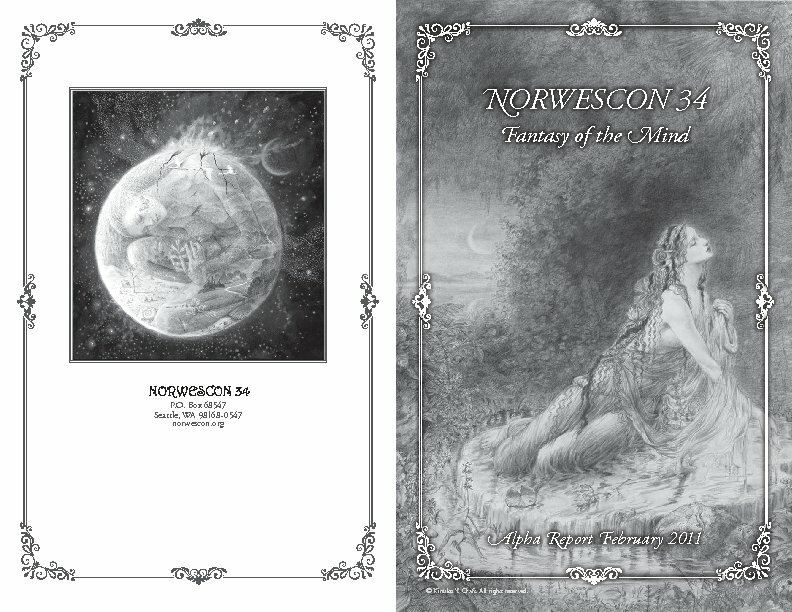 Norwescon 34 invites you to explore Fantasy of the Mind. First, PSIence Guest of Honor Marie D. Jones helps us explore paranormal phenomenon. With her help, we can delve deeper into the Time Prompt Phenomenon, look at various psychic possibilities, find out what might happen in 013, and examine Déjà-vu. Marie’s books explore these ideas, and more, through anecdotes, research, and history. Marie is also co-host on the popular Dreamland radio show interviewing luminaries in the fields of the paranormal, science, unknown anomalies, and alternative history. Next, Author Guest of Honor Patricia A. McKillip guides us on a fantastical journey to the realms of fairyland. Behind the world we see, there are other worlds, and Patricia McKillip takes us there. Her novels have been winners of the World Fantasy Award, Locus Award, and Mythopoeic Award, and have received numerous nominations for a variety of awards; in 2008, she was a recipient of the World Fantasy Award for Life Achievement. In addition to her well-know Riddlemaster trilogy, she has published more than 20 other novels and a number of short stories. Artist Kinuko Y. Craft will show us those worlds, and more, through her stunning paintings. Her work can be found on book covers, opera posters, fairy tale books, covers for many national magazines such as Time, Newsweek and The National Geographic, and has been added to the collection of the National Portrait Gallery. She is internationally recognized for her work and was inducted into the Society of Illustrators Hall of Fame in 2008. Finally, Special Guests of Honor Jim and Shannon Butcher. Jim Butcher takes you on a walk down the wild and fantastical streets of...Chicago. The Dresden Files, Jim’s gritty Urban Fantasy series, brings the supernatural right into the middle of a major American city. These novels, along with the Codex Alera series and Jim’s other books, take us through a variety of fantasy realms. Perhaps, when we see him in April, we can convince him to tell us about the strange and wondrous land of Missouri, where he lives. Shannon K. Butcher has two series in print the romantic suspense Delta Force Trilogy and an ongoing paranormal romance series “The Sentinel Wars.” Ms. Butcher entered the world of authorship after discovering her love of systems translated well to the writing of plots. In addition to our wonderful guests, a huge crew of pros and panelists will be serving up a ton of great panel programming. Also this year, Studio Foglio will be presenting a Girl Genius radio play, our popular “Let’s Make A Movie!” work shop is back, and we have some fantastic musical performances lined up. Prepare to be mesmerized, by Fantasy of the Mind. Hotel rooms sold out faster than ever for Norwescon 34! Norwescon officially exceeded its contracted room block on October 4, and over 2000 room nights have been booked. We have arranged an alternate room block and special Norwescon rate with the DoubleTree’s sister hotel down the street. Using the code NOR will garner you a $129.00 per night rate at the Hilton. Other area hotels also offer special Norwescon rates, but it is important to book early. Check the website for more information. Also, if you’ve reserved a room that you know you won’t need, consider offering your reservation on the Norwescon Forum so that other members can benefit. Reservations for suites, party rooms, and family rooms have begun being distributed on a first come first serve basis as of 12:01 AM on November 1, 2010, to members who wrote to hotels@norweson.org. This is also the address you should write to if you encounter any problems whatsoever interacting with the hotel! More information about reserving suites is available on the Hotel page at Norwescon.org. There are still parlor suites and family rooms available at the DoubleTree. Finally, to pass the time, you can write a limerick about the DoubleTree and send it to hotels@norwescon.org. If it’s funny, we will giggle! The assistants help make the show go off without a problem. There is a need for Stage Ninjas (must be 16+ yrs. ), Den Parents, Ushers, Door Guards, etc. If you would like to help, please contact the Masquerade Director. You will become a part of Company Lumbo- Tire for the weekend. The performers are up on stage showing off the costumes that make up the meat of our show. If you have a costume you would like to present, one that will impress the audience and judges, then this option is for you. No experience required, there is time to ask questions and practice in advance of the event. Come one. Come all. Let us make this one of the Best Masquerades ever. For those of you that enjoy Stargate, and all of the spinoff series, have we got a game for you. Do you recognize all of the glyphs on the 3 Stargates? Could you pick them out of a picture? Well, you will get the chance with this game. Check back on the website closer to the convention (con) for more information. At the con, please check the program book for more info on participating in the Stargate Scavenger Hunt. Thursday Good Bye Evergreen, Hello Grand 3!!! That’s right folks the Fannish Fetish Fashion show is taking over the grand ballroom! This year we plan to make the show BIG BETTER and even more BADASS! Let’s celebrate the move with a costume contest! We want to see you in your grandest fetish attire. Prizes will be awarded to the grandest of the grand. Also keep an eye on the NWC website for show and designer updates. For the Sunday Event, Special Events is looking to host a Paranormal Fair with a Psychic and Supernatural theme. We are hoping to locate people knowledgeable in palmistry, tarot cards, runes, iChing, numerology charts, horoscopes and things of that nature, as well as ghost hunters and paranormal or spiritual consultants. If you have any contacts or know anyone willing to volunteer their services, please forward their information to specialevents@norwescon.org or have them contact us via the website. Norwescon 34 Scheduled Gaming returns with your favorite tabletop, card and miniature war games. We provide some of the earliest scheduled events at the convention, and keep going until the con doors close! This year we will have longer hours to fill with even more games. If you want to schedule a game or three, contact us at specialevents@norwescon.org and we’ll reserve table space for you, as well as post information about your game in advance at the Norwescon web site. If you want us to try to find someone to run a game for you, contact us as well. We’d happily hear from both individuals and game companies wishing to present their products through demo or regular games. As always, if space allows, you’re welcome to come in and play any of the pickup games in our Gaming Library, or start a game with your friends. In addition to great games provided by dozens of game masters, we will have a Grand Prize drawing for everyone who participates in or runs a scheduled game. Details and pictures will be provided at a later date. Come on up to our gaming rooms and see what’s going on! Norwescon has an all-ages dance each night of the convention (Thursday, Friday, Saturday) for those of you who like to plan your convention in advance here’s a brief description of what is planned for these dances at this time. This ain’t your parents’ square dance! Put on your best dancing shoes and help us kick off Norwescon with DJ mc300baud and his eclectic mix of tracks. Expect the unexpected as he spins rave, wave, goth, alternative, rock, electronica, and more late into the night. He won’t let up until the cows come home. Come celebrate Mardi Gras-style as DJ Request and DJ Rohkan spin the mixes deep into the night. Don’t forget to attend the mask making panel earlier in the day to create your very own mask for the ball . . . or be one of the first 150 people to the door and get a free Mardi Gras mask. Saturday - it’s Saturday Night!!!! Join our new DJ Dancin’ Dan as he plays for you the best party hits of all time. You’ll hear it all from the rock & roll hits of the 50s, to the Motown sound of the 60s. Party to the disco era of the 70s and the new wave sound of the 80s. Show off your moves to the urban pop of the 90s and hip-hop sounds that kicked off the millennium. Dan will also live up to his name by joining in on some popular group dances too. Felice Nightengale, “Norwescon 34 Progress Report Alpha,” Norwescon History, accessed April 19, 2019, http://history.norwescon.org/items/show/75.